Provide comfort for the family of Roger Biram with a meaningful gesture of sympathy. Roger L. Biram “Mike” was born in Tonasket, WA, to parents, Art and Elizabeth Biram on May 7, 1932. He passed away at his home in Palisades, WA, on February 2, 2019, following a brave battle with cancer. He was the youngest of three, joining brother, Buck, and sister, Pat, whom all had many special memories of being raised on Badger Mountain. Mike is survived by his wife, Jan Biram; son, Shawn Biram; and daughters: Cindy (Mike) Bartz, Lori (Coby) Combs, Lisa (Dane) Keane, and Julie (Bud) Streeter. He has 11 grandchildren: Kellen (Chelsea) Keane, Clint (Cassidy) Keane, Kaylee Keane, Shelly (Jake) Treat, Elizabeth (Zach) Herrin, Tanner Bartz, Talon Bartz, Brock (Miranda) Streeter, Shelby Streeter, Kelsey Streeter, and Kiley (Taylor) Duby. He also has five great-grandchildren: Casen, and Kinsley Keane, Cade and Corbin Treat, and Denim Streeter Duby. Mike enjoyed his large family and was often seen attending his grandchildren’s basketball games, rodeos, and ropings, and always with a broad smile and a word of encouragement. The kids were blessed by a grandpa who taught them integrity and work ethic, and shared many special memories gathering, working with and branding cattle, as well as the many hours spent in the arena, roping until it was too dark to see. Mike attended Waterville High School. He played basketball, baseball, and football. He was the Most Inspirational Player on his basketball team. Of baseball, he said, “I played baseball in Waterville, and that was quite the experience, freezing cold and having hard balls thrown at you, not sure why I thought that was fun, but I guess it’s a memory!” He was active in the FFA, showing many championship cattle. He lettered in FFA and basketball. After graduating from Waterville High School in 1949, he then joined the Army and was stationed in Alaska, the only place colder than Waterville! He received a degree in radio and television communications from the Industrial Training Institute while in the Army. After his honorable discharge from the Army, he left the communications degree in the drawer and returned to his passion, ranching. Mike raised his own cattle and high-quality alfalfa hay in Palisades, WA. He was a pioneer in the cattle industry, being a member of the Douglas County Cattlemen and Washington State Cattleman’s Association. He was part owner and feedlot manager for the Columbia Feeders Association. In October of 1976, he traveled by airplane to Japan with a load of cattle, riding in the cargo area of the airplane, with the cattle sorted into individual stalls. He always had a great reputation for raising high quality cattle. He had a love for all animals, and always had a good dog by his side. He had a special ability to work with horses, raising and training many high-quality rope horses. It was always an honor to ride or purchase one of Mike Biram’s horses. He even tried his hand at being a jockey, competing at the Waterville horse races. He also competed in numerous rodeos around the Northwest competing in steer wrestling, calf roping, and team roping. He was a member of ACTRA and USTRC. 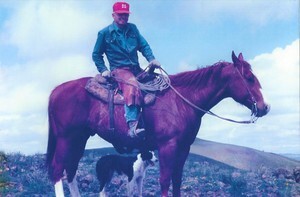 He was one of the founders of the Appleatchee Roping Club in Wenatchee, WA, and served as the club President for many years, and was awarded a lifetime membership. He won numerous saddles and buckles competing at all levels in team roping. Mike’s kindness always shined through at the ropings, and he roped with everyone, no matter the skill level, he figured the only way to get better was to enter, so everyone had to have that opportunity. Even as age caught up with him, his roping talent shined. At the age of 85, he still had many prizes to add to his collection, and he was very proud of the fact that he entered a roping after his 86th birthday. He was a champion in so many people’s eyes. Mike was involved in his community, serving as the secretary on the Palisades School Board for many years, as well as the Palisades Grange. He was very loved by friends and family and you could ask anyone, they would say that Mike was one of the best guys they ever met, always willing to help out; he had one of the biggest hearts. He never said much, but when he did, you better be listening because he always said something worth listening to. the hay is baled, your work on earth is done. We love you. A Celebration of Life Gathering will be held at 1:00 p.m., on Saturday, February 9, 2019, at the Palisades Grange Hall. The Palisades community will provide a light meal following the service. You are invited to view his tribute online at www.heritagememorialchapel.com to leave a memory or share a memory. Arrangements assisted by Heritage Memorial Chapel, East Wenatchee, WA. To send flowers in memory of Roger L Biram, please visit our Heartfelt Sympathies Store. Following Roger's Celebration of Life, the Palisades Community will provide a light meal at the Grange Hall. Travis & Jen Herring &Family, Steve &Cathy Motzkus sent flowers to the family of Roger L Biram. I have a lot of good memories of Mike at the various roping's we attended over the years. I will remember Mike as a good man with a mountain of integrity. Our deepest sympathy to you and your family. So sorry for your loss. Please know you and your family are in our thoughts and prayers. He will be missed by many. Your family is in our thoughts and prayers. Travis & Jen Herring &Family, Steve &Cathy Motzkus purchased the The FTD Uplifting Moments Bouquet for the family of Roger Biram.